Aquarium creatures in the manatee exhibit building. Turtles swimming around in the manatee exhibit. Watching pelicans being fed from behind the glass at the under water viewing area at the manatee hospital. It was strange watching from this perspective. Their little feet were going a mile a minute. 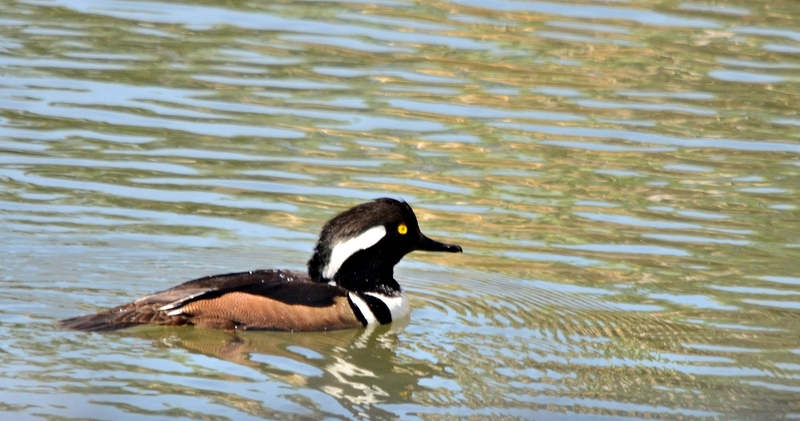 It’s not often you get to see a hooded merganser this close. He was swimming close to the window of the under water viewing window. The Lowry Park Zoo is getting a new water filtration system for the manatee hospital so there are currently no manatees at the zoo. Any injured manatees are now being sent to other manatee rehabbers until their new system is in. Normally you can go underneath and see the injured manatees that are being cared for at the hospital which is part of the zoo.. It’s unfortunate that any people visiting the area are not able to see these big guys up close but the zoo really needed to update its water system. And, it unfortunate that soon it will be installed and there will be new injured manatees swimming around there again. You can read about the hospital here. Thanksgiving weekend visitors to the backyard. 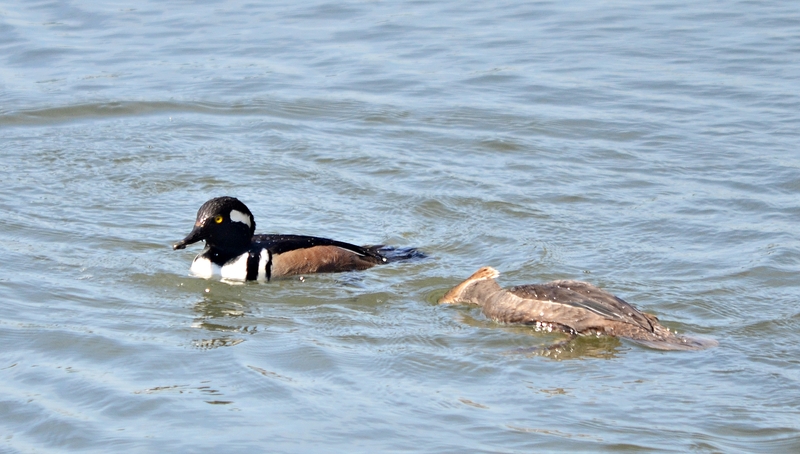 The female hooded mergansers showed up about a week after the males. Where were they? Out shopping for shoes? 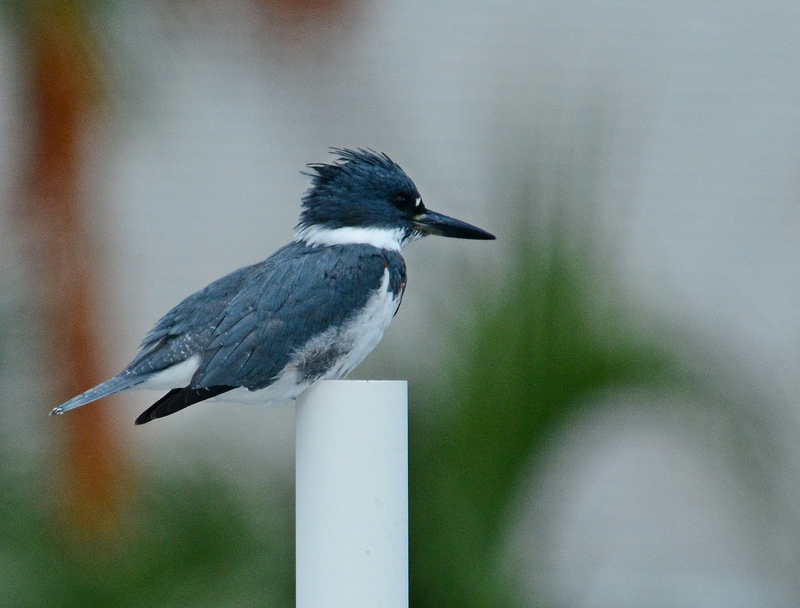 Our little kingfisher has been hitting our corner of the channel often. I guess it’s time to give him a name. Maybe Henry, after King Henry XIII. The resident osprey eating again. This time he had the dock all to himself. Fish instead of turkey anyone? A great blue heron stopped by. He was walking in the channel when the tide was very low. Later he was napping on the dock. This palm warbler has been walking around the backyard for weeks now. I don’t see him at the feeder. Just wandering around in the grass. The squirrels are ruining our screen on the porch. They go running across it or up it to get to the roof of the house and their little claws pull on the screen. After years of this the screens are starting to look worn and are being pulled out of the sides. We could have the porch re-screened but how do we keep the squirrels off? Getting a dog is not an option since I’m allergic. I could try something silly like putting one of those big plastic owls on the roof of the porch. It really doesn’t work for the birds but maybe squirrels? People put them on their docks to keep the pelicans from sleeping and pooping all over their docks but I see pelicans sleeping right next to the fake owl. I’ve seen osprey sitting on top of them eating their fish. These birds are smart. Are the squirrels smart too? 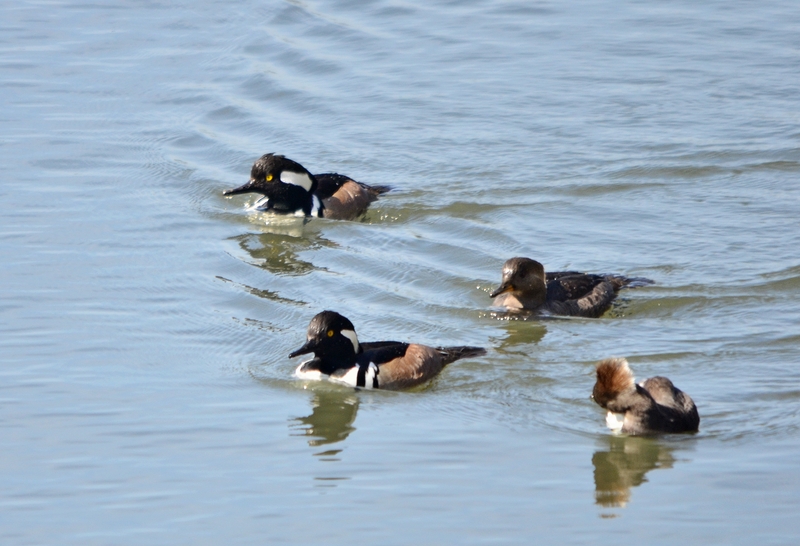 The hooded mergansers showed up in our channel in early November. I saw that flash of white and started yelling “The hoodies are back!” This is the 4th year we’ve had them floating in the water behind our house during the winter. These were taken through the bedroom window. If I just open the back door, they take off down the channel. At first we just saw 2 males. Since then we’ve had a few females show up. This one came pretty close to our dock. 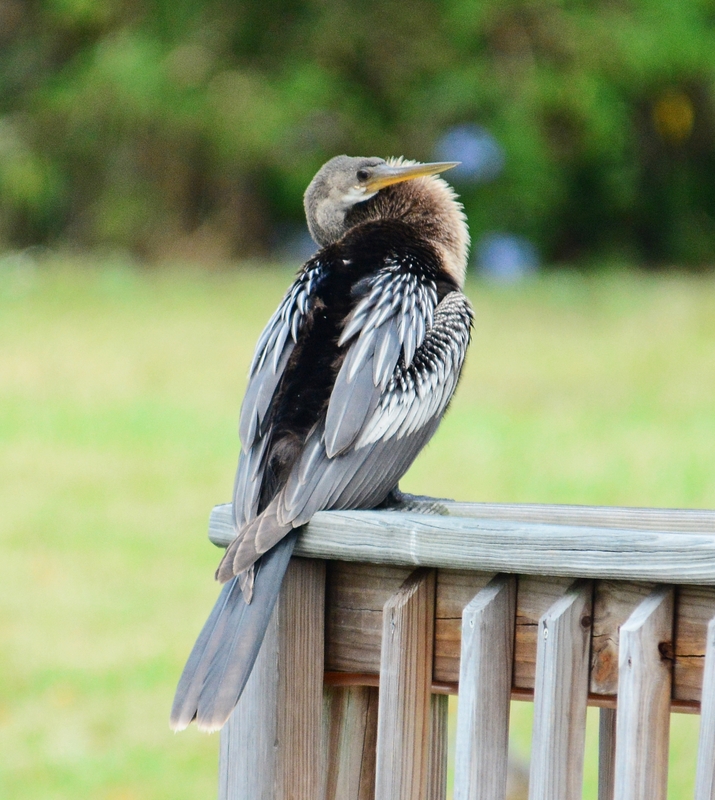 A female anhinga hanging out on our neighbor’s dock. 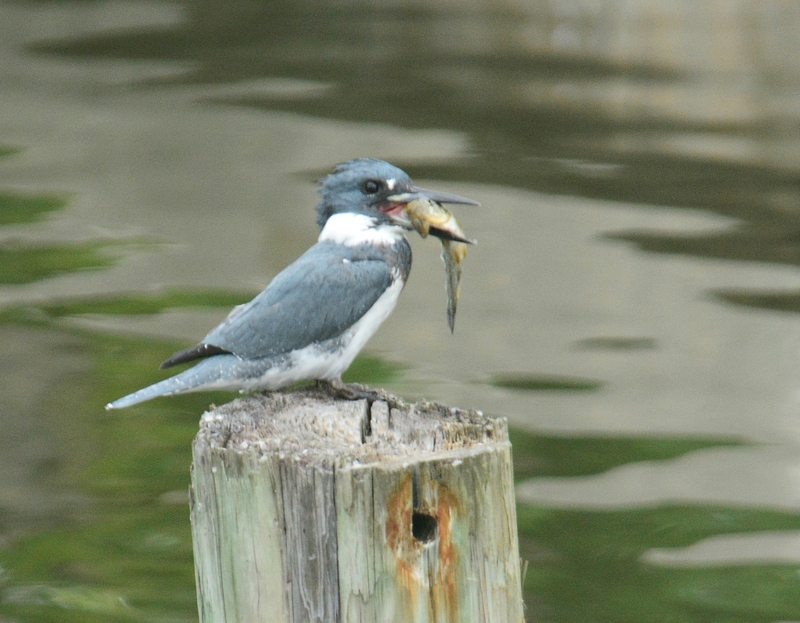 I noticed the little kingfisher sitting on our neighbor’s dock post and realized he had a fish in his beak. I snapped the above through the window. He saw me. 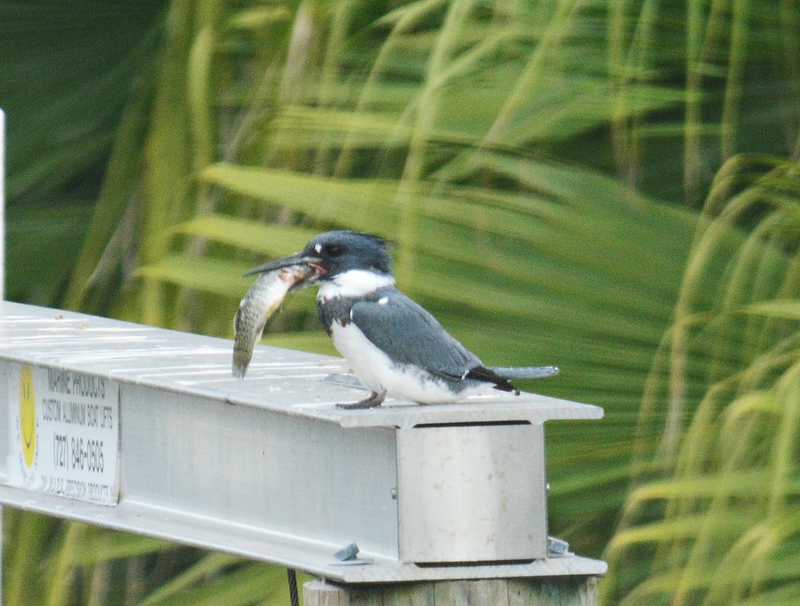 He flew down to our neighbor’s dock with the fish. Then he flew off down the channel so I didn’t get to see him swallow it. Later in the afternoon he was back on our dock. 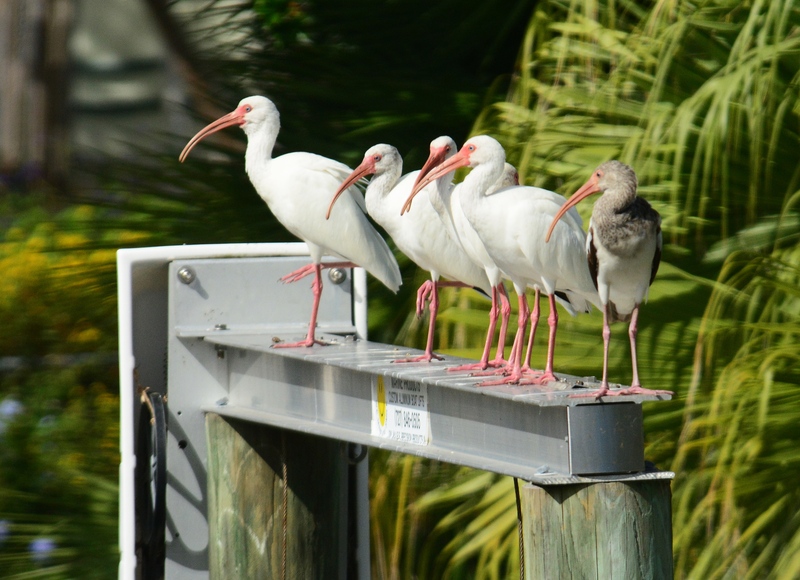 I noticed the white ibis sitting on my neighbor’s dock. They were watching something. On the other side of the dock was an osprey with a fish under his foot. 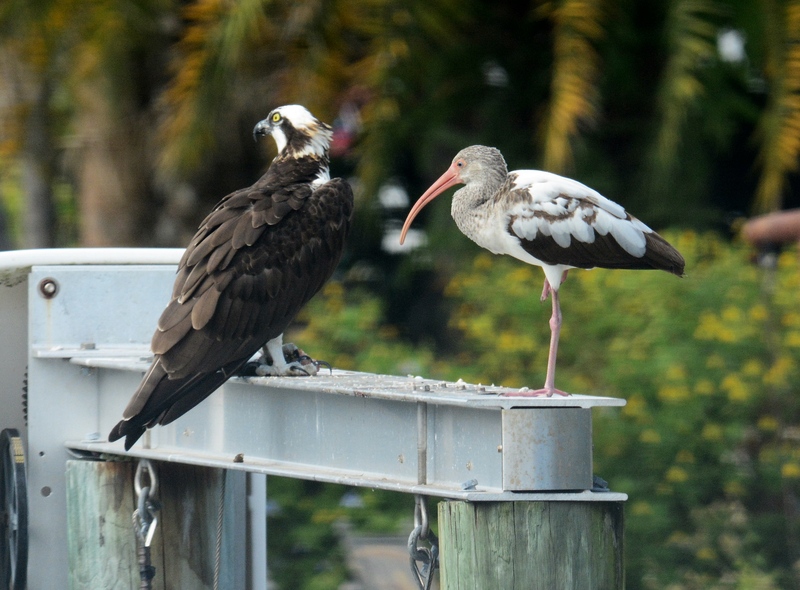 That juvenile ibis was pretty brave to fly over to him. The osprey eventually got tired of the crowd and left with his lunch. Just a few visitors to the backyard in the middle of November. 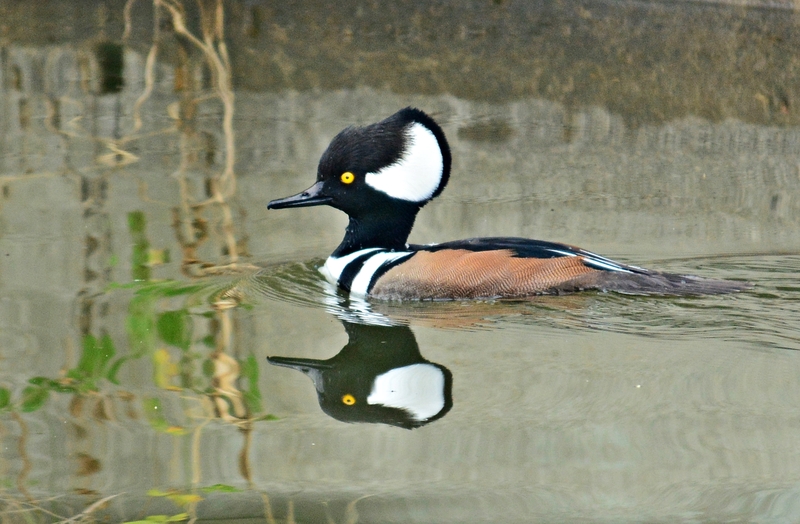 A male hooded merganser goes swimming by the dock. 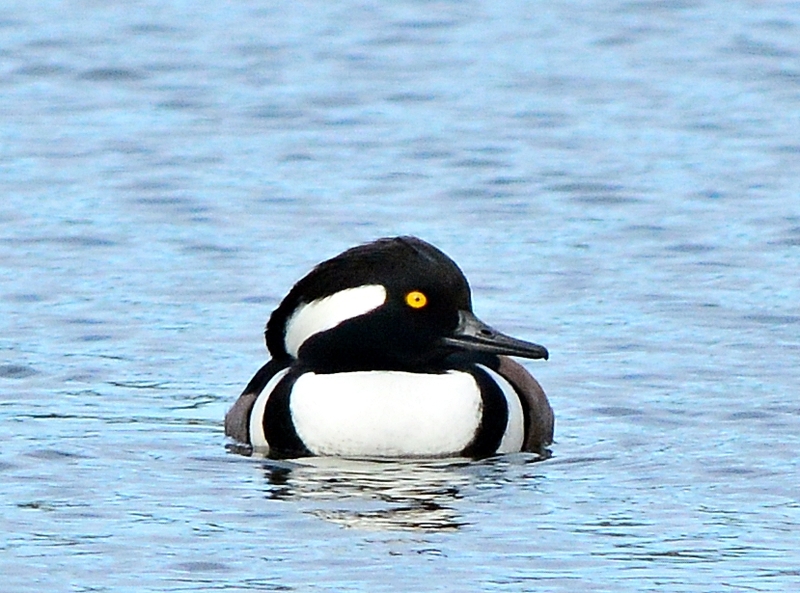 A male and female go by. She kept sticking her head under water. I guess she was looking for a snack. Two happy couples go swimming by. 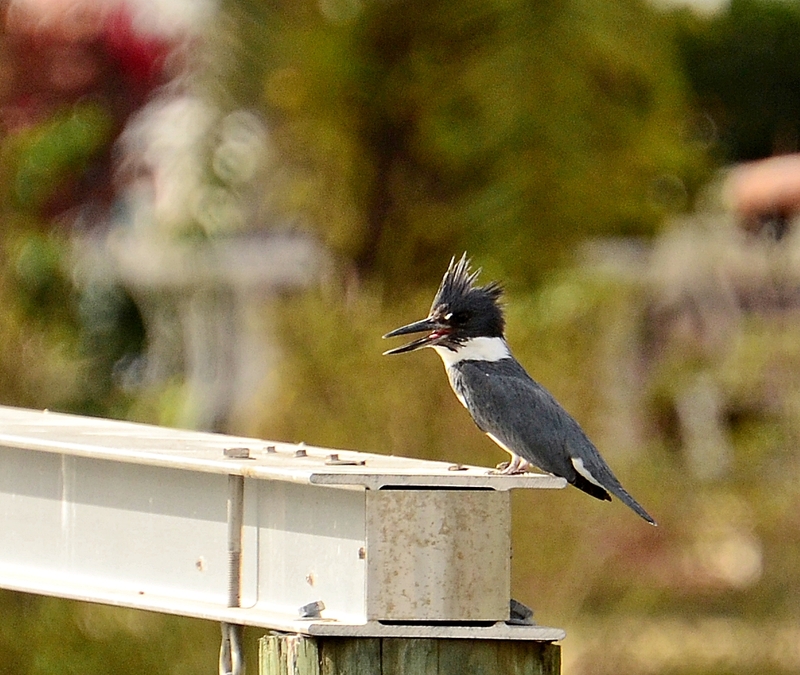 I caught a kingfisher sitting on my neighbor’s dock. She didn’t sit there long. 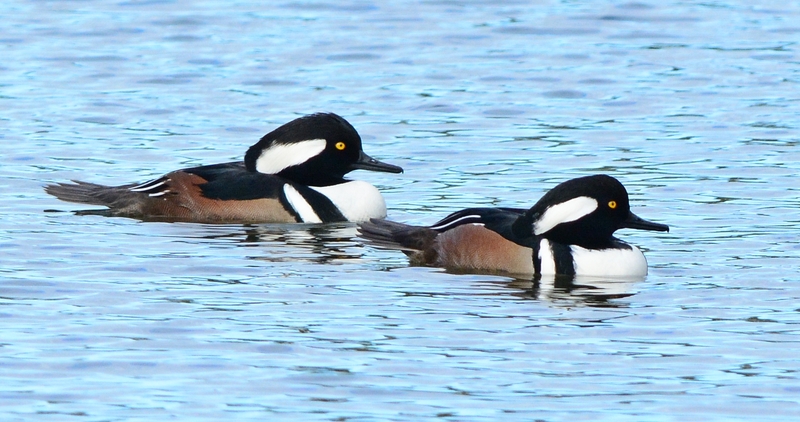 We’ve been getting a lot of hooded mergansers swimming in the canal behind our house. At one point I counted four couples swimming together. If the weather across the country stays this warm they’ll be going home soon. Last year I think I saw them through most of March. I haven’t been seeing the kingfisher very often in the last 2 months. This past weekend, she showed up for a few seconds. I just happened to be taking pictures of the mergansers when I saw her. Now that our big dead grapefruit tree is gone, we haven’t been getting very many tiny birds in the backyard. I moved the bird feeder to the other side of the house near the bushes but all we’ve been getting there are doves and blue jays. All pictures taken through the bedroom window.